It’s really tired for climate scientists to keep up the disclosure statement distancing themselves from definitively saying THIS STORM IS CAUSED BY CLIMATE CHANGE. We GET IT that you can’t say that and shouldn’t say that. But what is undeniable are the ingredients that are making these storms so unprecedented! Hell, even Michael Mann did that this week and WELL DONE to him for doing it! UPDATE: James Hansen has also spoken out… see here. Paul Beckwith connected the dots for everyone at the beginning of Harvey. Weather geeks can see it for themselves because we are seeing events all over the world. That’s one of the great things about the videos brought to you by the “Understanding Climate Change” channel. 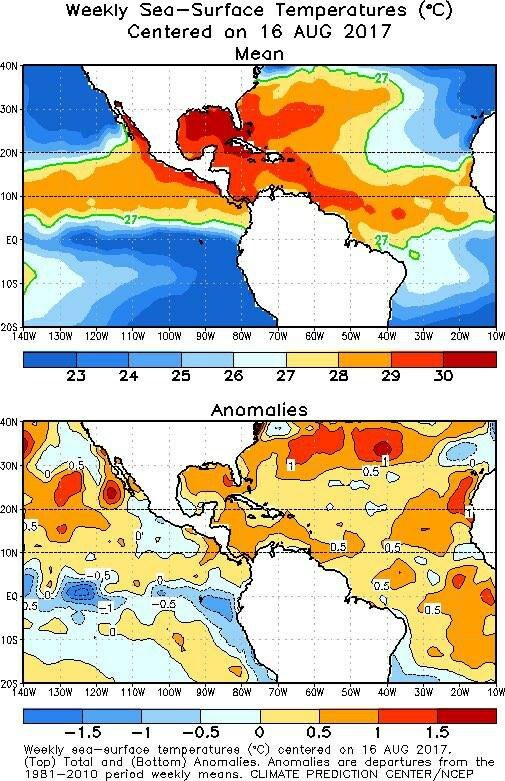 Warming oceans and air are changing storms. In addition to [rising sea levels], sea surface temperatures in the region have risen about 0.5C (close to 1F) over the past few decades, from roughly 30C (86F) to 30.5C (87F), which contributed to the very warm sea surface temperatures (30.5-31 C or 87-88F). There is a simple thermodynamic relationship known as the Clausius-Clapeyron equation that tells us there is a roughly 3 percent increase in average atmospheric moisture content for each 0.5C (~1F) of warming. Sea surface temperatures in the area where Harvey intensified were 0.5-1C warmer than current-day average temperatures, which translates to 1-1.5C warmer than the “average” temperatures a few decades ago. That means 3-5 percent more moisture in the atmosphere.